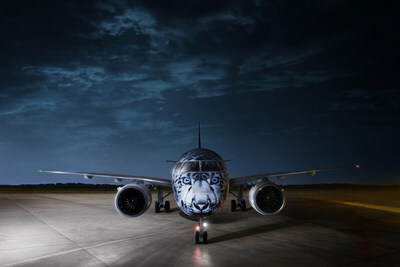 ASTANA, Kazakhstan, Dec. 14, 2018 /PRNewswire/ -- Pratt & Whitney, a division of United Technologies Corp. (NYSE: UTX) joined Air Astana today in celebrating the delivery of the airline's first Embraer E190-E2 aircraft. The E190-E2 is powered exclusively by Pratt & Whitney GTF™ engines. The delivery was commemorated in a celebration attended by officials from Air Astana, Embraer and Pratt & Whitney at Air Astana's Aviation Technical Centre in Astana, Kazakhstan. "Air Astana is pleased to add the E190-E2 aircraft to our growing fleet. We are currently enjoying the economic and environmental advantages of our GTF-powered Airbus A320neo family aircraft, and the E190-E2 aircraft will provide additional benefits as well as significantly improve our passenger experience," said Peter Foster, president and CEO of Air Astana. Air Astana is the first airline to operate the GTF engine on two aircraft platforms, currently operating 4 GTF-powered A320neo family aircraft and with an additional 13 aircraft on order. The airline also operates three PW4000-powered Boeing 767 aircraft and 12 V2500-powered A320ceo family aircraft. "Pratt & Whitney truly values the confidence that Air Astana has placed in our engines, especially in the clean, fuel-efficient geared fan technology of the GTF engine," said Rick Deurloo, senior vice president of sales, marketing and customer support at Pratt & Whitney. "We look forward to continuing to collaborate with Air Astana to support their fleet for many years to come." In addition to being selected as the exclusive engine for the E2 commercial aircraft, Pratt & Whitney's APS2600E auxiliary power unit (APU) is the sole-sourced APU for the E2 family. The APS2600E APU gives airlines greater flexibility, by increasing the altitude ceiling for ETOPS and other operations, and providing a significant increase in electrical power delivery, to meet the needs of today's airlines. Since entering into service in early 2016, the GTF engine family has delivered on its promised ability to significantly reduce fuel burn, NOx emissions and noise footprint. Pratt & Whitney is a world leader in the design, manufacture and service of aircraft and helicopter engines, and auxiliary power units. United Technologies Corp., based in Farmington, Connecticut, provides high-technology systems and services to the building and aerospace industries. To learn more about UTC, visit its website at www.utc.com, or follow the company on Twitter: @UTC. To learn more about the GTF engine, visit pwgtf.com. To receive press releases and other news directly, please sign up here.